Diamond transistors; switchable transistors; graphene kills bacteria. To advance the development of more robust and energy-efficient electronics, materials scientists from Japan’s National Institute for Materials Sciences have developed a new diamond transistor fabrication process. With this in mind, the team developed a new fabrication process involving diamond, bringing “hardened electronics” closer to realization. The research group said they focused their work on enhancement-mode metal-oxide-semiconductor field-effect transistors (MOSFETs), a type of transistor that is commonly used in electronics, and that one of the developments that makes the fabrication process innovative is that yttrium oxide (Y2O3) insulator was deposited directly onto the surface of the diamond [to form the gate]. The yttrium oxide was added to the diamond with a technique known as electron beam evaporation, which involves using a beam of electrons to transform molecules of yttrium oxide from the solid state to the gaseous state so that they can be made to cover a surface and solidify on it. This has many desirable qualities, including high thermal stability, strong affinity to oxygen and wide band gap energy, which contributes to its capabilities as an insulator. Going forward, the team hopes to refine their understanding of electron movement through the diamond transistor with future research projects, and ultimately to build integrated circuits with diamonds. 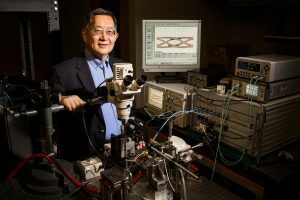 In a development that could be used to boost computer processor speeds, University of Illinois researchers have unveiled an upgrade to the transistor laser to allow the formation of two stable energy states and the ability to switch between them quickly. The team reminded that modern computers are limited by a delay formed as electrons travel through the tiny wires and switches on a computer chip, and to overcome this electronic backlog, engineers would like to develop a computer that transmits information using light, in addition to electricity, because light travels faster than electricity. Further, having two stable energy states, or bistability, within a transistor allows the device to form an optical-electric switch. That switch will work as the primary building block for development of optical logic – the language needed for future optical computer processors to communicate, explained Milton Feng, the Nick Holonyak Jr. Emeritus Chair in electrical and computer engineering at the University of Illinois. “Building a transistor with electrical and optical bistability into a computer chip will significantly increase processing speeds because the devices can communicate without the interference that occurs when limited to electron-only transistors,” Feng continued. The researcher team has now described how optical and electrical bistable outputs are constructed from a single transistor. The addition of an optical element creates a feedback loop using a process called electron tunneling that controls the transmission of light. Rice University and Ben-Gurion University of the Negev (BGU) researchers have discovered that laser-induced graphene (LIG) is a highly effective anti-fouling material and, when electrified, bacteria zapper. According to their report in the American Chemical Society’s ACS Applied Materials and Interfaces, LIG also protects surfaces from biofouling, the buildup of microorganisms, plants or other biological material on wet surfaces. “This form of graphene is extremely resistant to biofilm formation, which has promise for places like water-treatment plants, oil-drilling operations, hospitals and ocean applications like underwater pipes that are sensitive to fouling, The antibacterial qualities when electricity is applied is a great additional benefit,” Tour said. According to the team, when used as electrodes with a small applied voltage, LIG becomes the bacterial equivalent of a backyard bug zapper. Tests without the charge confirmed what has long been known — that graphene-based nanoparticles have antibacterial properties. When 1.1 to 2.5 volts were applied, the highly conductive LIG electrodes “greatly enhanced” those properties.